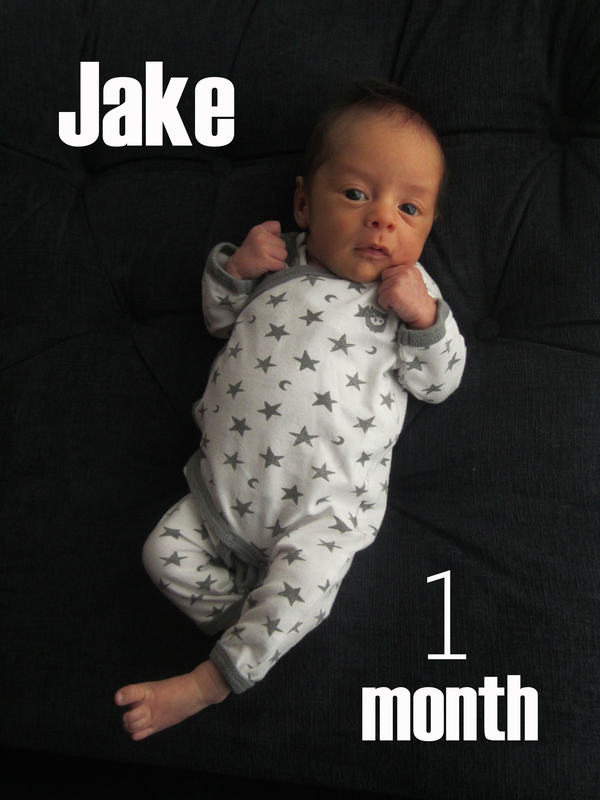 It’s been exactly one month since Jake’s birth, and 32 years since mine. My how time flies! 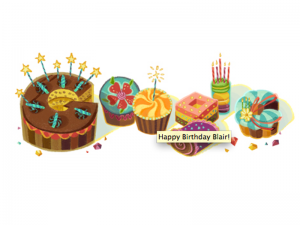 Even Google remembered my birthday! Jake’s birth was a scheduled c-section, so no bumps or surprises. When the doctor pulled him out and showed him to us, Johan and I just stared in awe at this perfect little baby that we had waited desperately for. We just stared at him, until the point the doctor asked if we didn’t want to take a picture. Oh yeah… That would be nice. Thanks doc! This post is going to be mostly pictures as my brain isn’t quite functioning at 100% today, or on most days. 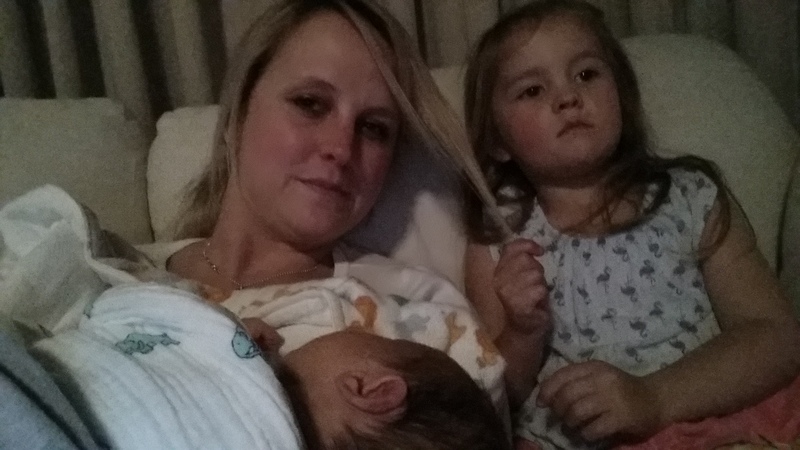 This parenting is tough stuff. The toughest thing I’ve ever done. Feeding every three hours doesn’t mean you actually get three hours of sleep. No, sir! Johan helps out a lot, as I am not afraid to wake him up to change a diaper or two, or three in the early hours of the morning, but an hour here or there of sleep does not fill up the sleep tank that one needs to function at full speed. Sleep when the baby sleeps, they say. That doesn’t work. It just doesn’t. That’s the time you can use the bathroom, call a friend or shower. Ah, showering. There’s nothing like a hot shower, to only be pee’d on minutes later. I am not complaining, because it is quite funny. Ava never did that, but Jake! Man, he can getcha good. 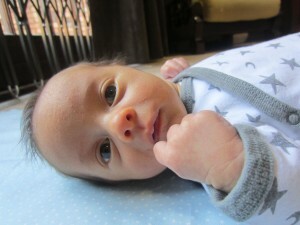 It’s like he was born with perfect aim and hits mom every time. Once I have time to do a little research, I am going to look into the benefits of baby puke in your hair. All those vitamins and minerals just soaking in, there must be some kind of benefit, right? Please don’t take this as complaining, I am laughing as I write this. I couldn’t be more happy than I am at this very moment in my life. This is my best birthday ever and the day has just begun. Who wants a knuckle sandwich? 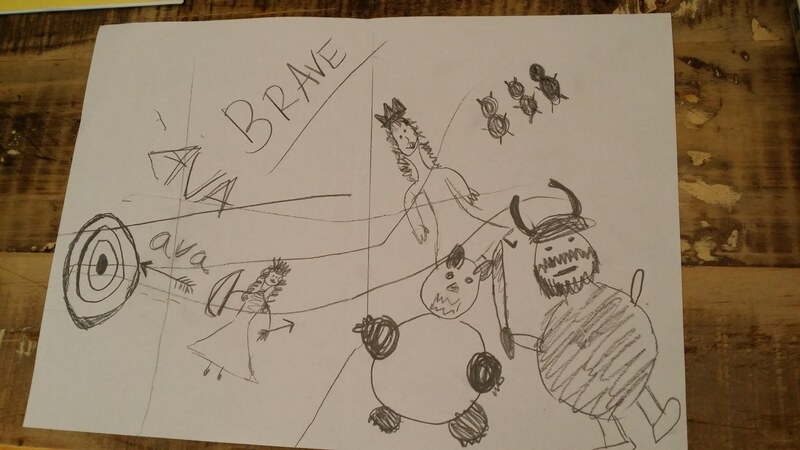 Ava’s new favourite thing is to tell me a story and I illustrate it. 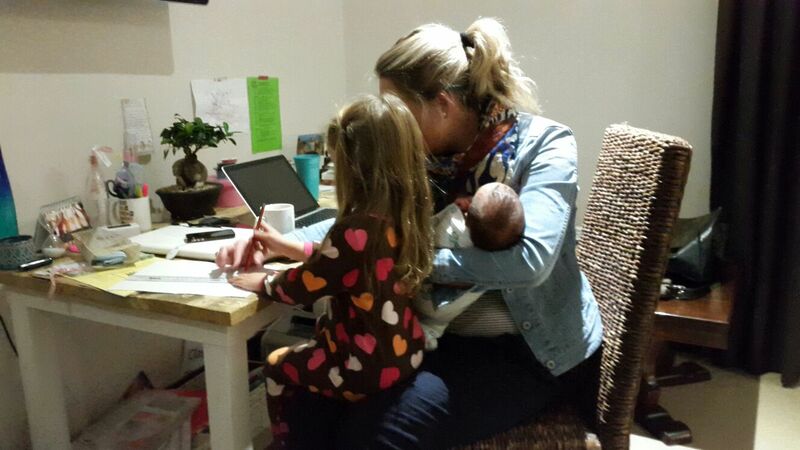 Here we are “working”. 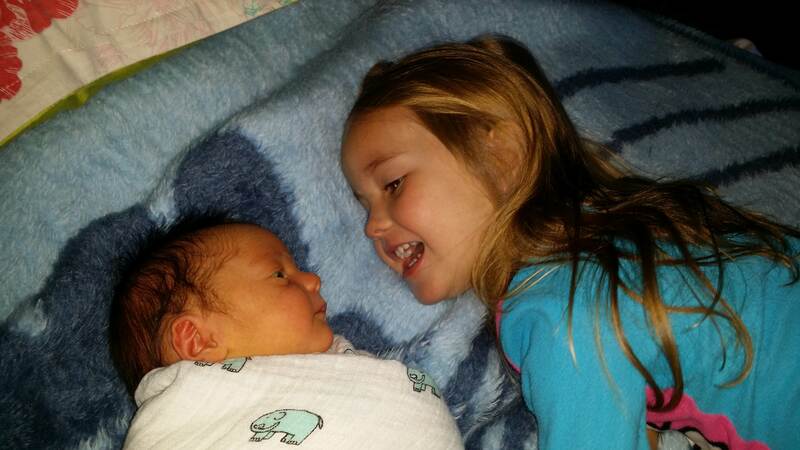 I am really proud of the way Ava has made the transition into big sister. Not to say we haven’t had our issues, but I think that’s her age. Just trying to feed this kid is a daunting task. Today she likes strawberries, tomorrow she doesn’t. Then last night we bribed her into eating our dinner of chicken and pesto pasta and she’d devoured it. So it’s up and down. But she is a real doll and loves her brother to bits. 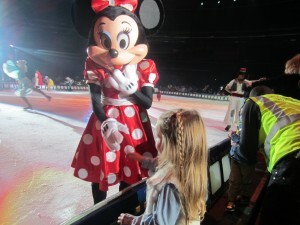 Ava and I went to Disney on Ice with some friends. She sat in awe for the entire show. 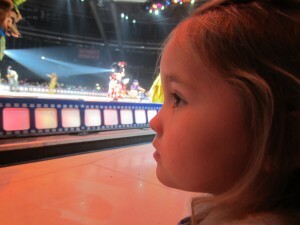 I cannot wait for the day I get to take her to Disney World. We are hoping for 2016. Bailey’s graduation and throw in a little Disney. Sounds like a great plan to me. Tim McGraw’s song, In My Next Thirty Years, just came on Songza. Nothing could be truer, because in my next thirty years, I’m gonna have some fun! Gotta run, going out to lunch with my friends! Happy birthday to me and Jake! You always know how to make me feel special. Love ya, girl! What a wonderful way to start the day! Love to read the blog and kid stories. I can hear your dad now- I am just going to be there one minute. Oh the kids are wonderful. It is the one thing in life that has no manual. Each one is different. The two of you have two beautiful children with lots of adventures ahead. Happy birthday to you and I hope you celebrate with a tea party with Ava. Thank you Kate! I can’t stop staring at your profile pic. You look like a super model!